This is a typical pass through a low point or neck. It climbs quickly from 493m in the east to reach the 545m high summit point after 0,8 km, then follows a longer descent into the west losing 122m of altitude. The road runs along the east-west axis and be very rough due to lack of maintenance and rainfall. This is also the last pass you will traverse before reaching the Baviaans Lodge and the southern start of the Baviaans-Kouga 4x4 Trail. The term 'meide' is Afrikaans and refers to a female servant. In this context in the previous century, the term would not have been in the slightest way derogatory, but in modern South Africa the word is seldom used and is considered offensive. This is quite a unique pass as it holds a number of extreme statistics under its rutted gravel surface. It's a short pass at only 2,5 km but packs a staggering 47 bends, corners and curves into that length, which works out at one bend every 53 metres! There is no other pass in South Africa to equal this! Besides the large number of corners, this pass is also steep with an average gradient of 1:14 and some very steep sections at 1:5. The scenery is fantastic as the pass follows the path of a tributary of the Nooitgedacht River, but the cherry on top of all these impressive figures is the ghoulish history of this pass, where a murder took place about 200 years ago - and it's how the kloof got it's name. There are other passes in South Africa with similar names, like Moordenaarsnek (EC) and Moordenaarspoort (NC). This interesting gravel pass if well above the national average in terms of length at 7,2 km and ascends 352 metres up the southern side of the Suuranysberg mountain to summit at 562m ASL. The pass offers excellent vistas over the Kromrivier valley, which it follows for most of it's length and the town of Kareedouw is also visible from the pass. The pass is peppered with 54 bends, corners and curves of which three are semi-hairpins and a further four exceed 90 degrees radius. The condition of this road can vary greatly depending on when the last maintenance was done, as well as recent rainfall. Mostly it can be driven in any vehicle in fair weather conditions. 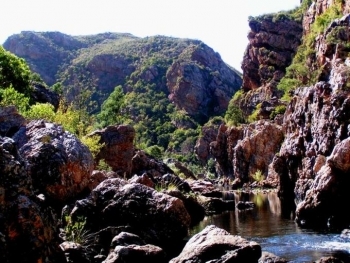 The Suuranysberg range is about 16 km in length and runs along the east-west axis, forming the southern watershed into the Kromrivier as well as the northern watershed into the Kouga River. The range has peaks which reach a maximum height in the 750m range. The pass is obviously named after the mountain which it ascends. 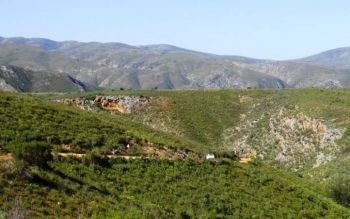 This lovely pass decends and ascends the beautiful Kouga River valley. It of average length at 4,6 km and has a substantial altitude drop of 181m producing an average gradient of 1:25, with the steepest sections measuring in at 1:8. 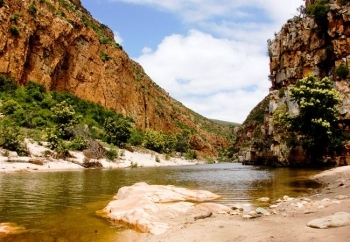 The pass connects the farming areas to the north of Kareedouw with the R62 and offers exceptional views over the Kouga River gorge, regardless of which direction you drive it. At the lowest point, where the river is crossed via a low level concrete causeway, there is a beautifully sited timber chalet right on the banks of the river (built on raised pylons) which is for hire and makes for an idyllic and quiet overnight spot. 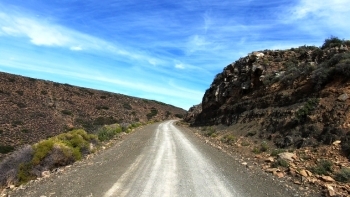 The road carries very little traffic and is also the access road to both Moodenaarskloof Pass to the east as well as Meidenek to the west and after that the start of the Baviaans-Kouga 4x4 Trail. The road is suitable for all cars, but the condition can vary considerably depending on when last maintenance was performed as well as recent rainfall. When travelling from Sutherland to Ceres via the Tankwa Karoo, this is the first of three small passes that have to be negotiated, with the other two being Thyshoogte and Jukhoogte. The pass is moderate in all respects with an altitude variance of 172m over 3,7 km producing an average gradient of 1:22, with the steepest sections being on the eastern side near the summit where things ramp up to 1:8. Despite the moderate statistics, there are a few dangers on this pass. There is one sharp right hand bend leading into the ravine section which has some negative cross-flow and there are also some unguarded drop-offs on the left, which would cause serious damage if your vehicle left the road. During the week you are unlikely to come across any other vehicles on this road, but over weekends it could be a little busier, when dust and overtaking suddenly become major issues. It's best not to be in a hurry on this road and take the time to stop frequently and savour the timeless beauty of the Tankwa Karoo. This record breaking pass has rocketed into the No.1 position as the steepest pass in South Africa with an average gradient of 1:5,567 and to add to this impressive statistic is that it is gravel all the way. It's a short pass at just 2,6 km but it packs no less than 9 hairpin bends into that short distance. We recommend a high clearance 4x4 for this pass. 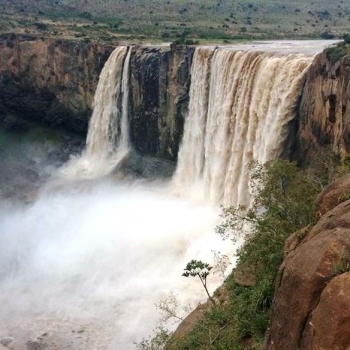 It's named after the peak that forms the horseshoe bend near the confluence of the Tsitsa and Tina Rivers, called Mpindweni which has a summit height of 408m. The pass presents dense indigenous bush along the first half, wherafter it breaks out into open grassland where magnificent views of the three main rivers can be seen. This is a road that ends at the last village at the north-western end of the horseshoe bend in the Tsitsa River. Only the most dedicated pass hunters will seek this one out as it involves a long and complex route to get here - and then you have to retrace your path all the way back to Libode. But for those who dare, the rewards will be immeasurable. This steep pass is 5,9 km long and lies just a few kilometres east of it's twin pass, the Buwani Pass. 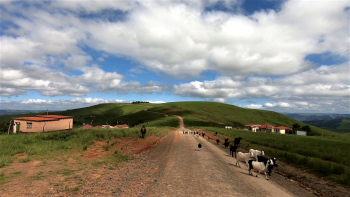 The Dungu pass is longer and has a bigger altitude variance, but both join up in a common road along the northern bank of a big loop in the Umzimvubu River, about 57 kms SSE of Mount Frere in the heart of the old Transkei region. It forms a perfect circular loop where both these passes can be driven in tandem. The Dungu Pass has an exceptionally steep average gradient of 1:10, but some sections get very steep at 1:5. In wet weather this pass should only be tackled in a 4WD vehicle. 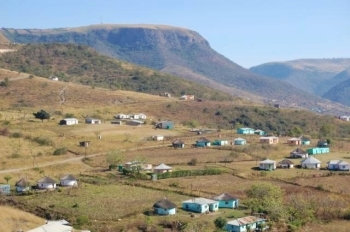 Panoramic scenery, steep cliffs, deeply wooded mountain slopes and birds eye views of the Umzimvubu River valley are all on the menu. There are 59 bends, corners and curves which include 2 tight hairpins and 4 corners greater than 90 degrees. We issue our standard cautionary for all Eastern Cape rural roads, and especially those in the old Transkei area: We recommend driving this road in a small convoy of two to three vehicles in case of emergency. Be aware of personal safety at all times and make sure you leave the nearest town with full fuel tanks and that your vehicle is serviced and reliable. 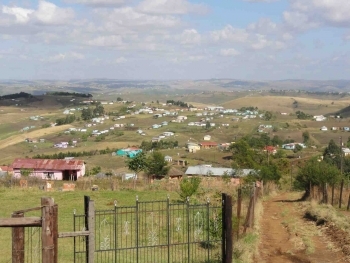 This is another remote and difficult to get to old Transkei pass, which is 4,4 km long, displays an altitude variance of 408m and generates an average gradient of 1:11 making it amongst the steepest in the whole country. 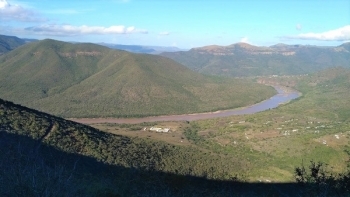 Add a high rainfall area, livestock on the roads, a rough and rutted surface with spectacular views of the Tina and Umzimvubu rivers, you have a wonderful recipe for an adventure pass that will set you into a small elite group of people that have ever driven into this remote area. Even the 1:50,000 government maps don't record this pass, so it's a fairly new one and only visible on Google Earth. The pass has 45 bends corners and curves, including one hairpin and six corners which exceed 90 degrees radius. The views are breathtaking and include thatched huts that dot the hillsides, with imopressive views over the deeply incised hills smothered in grassland and pockets of indigenous forest. This major gravel pass will enthrall and enchant even the most jaded pass hunter. It is long, steep, rough and peppered with 301 bends, corners and curves of which 7 are hairpins and another 29 exceed 90 degrees radius. It achieves top 10 status in two categories as the 5th longest pass and the 7th biggest altitude gaining pass in South Africa. 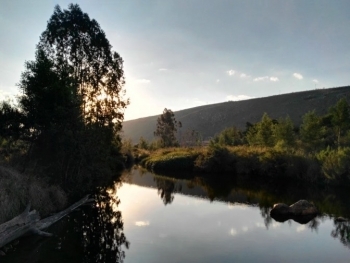 It's named after the Mtzintlava River, which is one of the main tributaries of the Umzimvubu River with which it forms a confluence about 15 km to the south west of the pass. It connects Tabankulu with the R61 (between Flagstaff and Port St Johns) and provides access to dozens of Wild Coast villages along the way and includes a crossing of the powerful Mzintlava River, now famous for its Mamlambo creature (or brain sucker as it became known). This massive gravel pass is for the more serious pass hunter as it's well off the beaten track, is gravel surfaced and traverses some major climbs as well as crosses the mighty Mzimvubu River. It's a very long pass at 29,8 km and holds a number of challenges with some gradients reaching 1:6, which will mean traction issues in wet weather for non 4WD vehicles. It displays a big altitude variance of 685m and the 192 bends, corners and curves will require your full attention. Add in slippery surfaces, livestock, children, poultry, slow vehicles and minibus taxis and you can expect a very eventful journey along this big traverse.